HICKORY, NC (August 10, 2018) – Transportation Insight, a global Enterprise Logistics Provider and end-to-end supply chain strategist, is featured among industry analysts’ premiere lists of leading third-party logistics (3PL) providers. Delivering Tier One transportation and supply chain solutions for more than 1,500 manufacturers, retailers, e-tailers and distributors across North America, Transportation Insight is selected as an Inbound Logistics Top 100 3PL for the seventh consecutive year. The recognition follows the Inc. 5000 Hall of Fame member’s continued ascent in the annual lists of Global and Domestic 3PLs published by market-leading 3PL industry analyst Armstrong & Associates. Transportation Insight’s top-tier core and value-added supply chain services feature best-in-class solutions across multiple modes, including Parcel, LTL and Truckload. Transportation Insight’s strategic carrier sourcing, freight invoice audit and payment, network optimization and LEAN consulting and client training underpins the business consultant’s ability to improve shippers’ transportation cost management. Meanwhile, with supply chain and advanced parcel analytics, parcel audit and optimization, warehousing, international logistics management and import/export compliance consulting, Transportation Insight’s service portfolio can be customized to bring optimal value to e-commerce shippers operating in business-to-consumer and business-to-business environments. 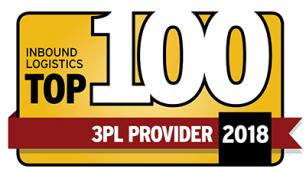 Inbound Logistics’ annual Top 100 3PL Providers list serves as a qualitative assessment of service providers that are best equipped to meet and surpass evolving outsourced logistics needs. Organizations recognized in the annual list are selected based on submitted information, personal interviews and online research compared against shippers’ emerging global supply chain and logistics needs. Transportation Insight’s success providing client partners with effective supply chain solutions that meet ongoing and emerging needs is reflected by the U.S. Environmental Protection SmartWay Excellence Awardee’s ongoing ascent in Armstrong & Associates’ annual lists of largest 3PL providers. In the 3PL analyst’s 2018 list of Top 50 Domestic 3PLs, Transportation Insight climbed to No. 20. The lead logistics provider is No. 37 in A&A’s annual Global List of leading 3PLs based on revenue. In addition to this latest recognition from industry analysts and publications, Transportation Insight’s comprehensive supply chain capabilities are further reflected by other 2018 awards for supply chain excellence, including Inbound Logistics’ G75 award for top green supply chain partners, Supply & Demand Chain Executive’s SDCE 100 Top Supply Chain Project Award and Food Logistics’ Top Green Providers. This year, Supply & Demand Chain Executive recognized three of Transportation Insight’s domain experts as Pros to Know, and members of the company’s deep roster of industry thought leaders are regularly invited to share their insight during industry events and association meetings. Recent and upcoming speaking engagements offer insight to audiences attending events sponsored by the Economic Development Partnership of North Carolina, APICs and the Institute of Management Accountants. Transportation Insight’s Global Trade Compliance experts will present “Mitigating Risk at the Border” during Parcel Forum 2018 on Sept. 26. Inbound Logistics is the leading multi-channel content provider targeted toward business logistics and supply chain managers, www.inboundlogistics.com.